allowed with payment of a pet fee. Each bedroom (except for the kid's bunk room) has a television, plus one in the living room. Pool, Jacuzzi, Air conditioning, wireless internet access, BBQ grill, Washer/Dryer, Linens provided, Dishwasher, Microwave, Coffeemaker, Cooking utensils, Cable TV, DVD Player, VCR, CD Player, Stereo, Telephone. It was a beautiful location! 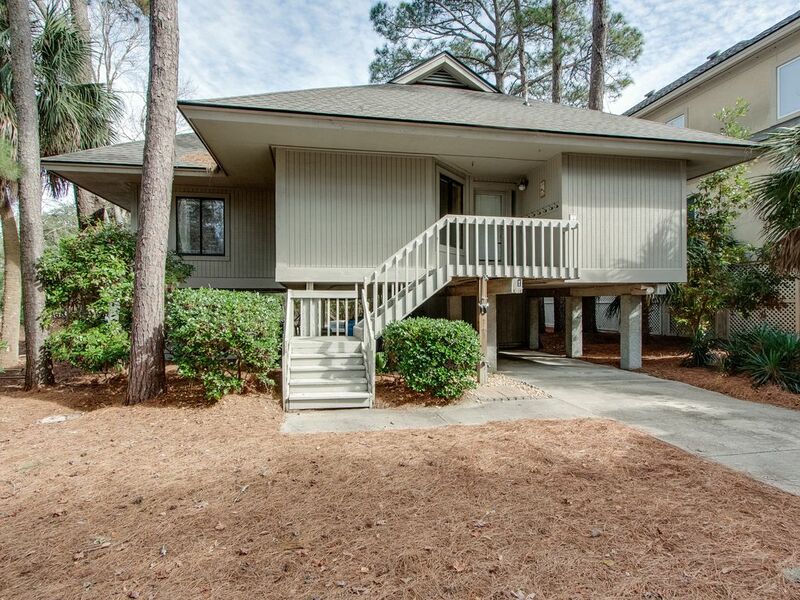 Walking distance to the beach and private pool/hot tub. We will be back! We will look forward to having you back! If you are looking for an affordable place and great location, this is the place. It may not have all the bells and whistles of some of these other multi-million dollar homes however it very comfortable and CLEAN. The owners are awesome to deal with and are attentive to your every need. I would recommend this place to all my friends and family. We will be back !!! We are so glad you enjoyed your stay and look forward to hosting you again! The house met all our needs for a fun vacation at the beach. It was also very pet friendly! Just a short walk to the beach made it easy to go back and forth. The washer & dryer helped too. The Kitchen had everything we needed to cook when we wanted to. Close to most everything HHI had to offer. Thanks! So glad you enjoyed your trip! We would love to host you again! The house was as advertised. We were a bit delayed in moving in as there had been a water pipe break that delayed the cleaning company from cleaning. This set everything back and the cleaning company was probably not as thorough as normal since it was after 4 and we were there waiting for them. The spa controls did not work so paying the extra money to have heated was not worthwhile. (We did not call this into property manager so this is on us.) The pool was well maintained and we enjoyed our time around the pool and in the home. The proximity to the ocean and bike trail is fantastic. We would stay at this home again. My family loved the location. The house was perfect for us. We already booked for next year. So glad you enjoyed your stay! We are looking forward to hosting you again next year! Location was great and we were overall pleased with the house. We did have some issues with the AC. When I emailed, the owner immediately responded and had someone come out to look at it. We were impressed by the amount of beach toys and beach chairs. We did not even need to bring ours from home! Glad you had a fun trip! Sorry about the AC issues, but I'm happy we were apple to get them worked out quickly. Hope to see you again! people continue to come back to year after year to visit!